Magnets & Beer: What could go wrong? Quite a few of our customers have asked us how magnets can be used to catch falling bottle-caps under a bottle opener. We figured it was about time to try this out for ourselves. While we originally thought this might be a little bit of a magnet gimmick, the end result turns out to be really great, and maybe even a little useful. To open the bottle, a regular, wall-mounted bottle opener is used. There are a number of these products available. Some are made of bent sheet-metal or stainless. We like the tough, cast products. We found a few called "Starr X” openers that seemed like the classic openers we were looking for. The basic idea is to mount the opener to a wall or other vertical surface, and then have a strong magnet underneath it to catch the falling caps. This lets you open the bottle one-handed and not worry about catching the cap. 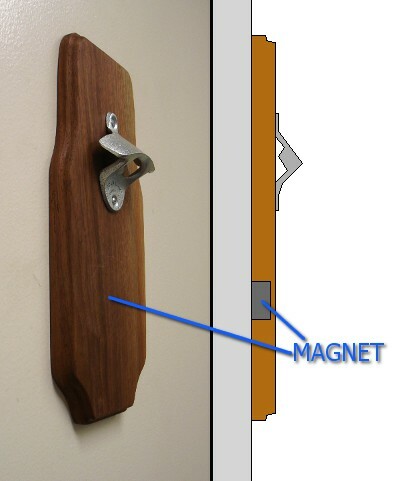 A typical setup places the strong magnet behind some surface so that the magnet is hidden. While we constructed ours from wood, we’ve also seen solutions that use non-magnetic stainless steel or other non-magnetic materials. What size magnet should be used? The right magnet depends on a number of factors. How strong should it be? Does it need to hold just a few caps, or many? Larger magnets obviously will hold more caps, though super strong magnets might make it difficult to remove all the caps by hand! We figured a good goal is 24 bottle caps held by the magnet. Also important is the distance between the magnet and the bottle caps. This distance should be kept as small as possible to maximize the strength. It is probably not a good idea to try this with ¼” or 1/2” thick surfaces. We discussed the importance of keeping this non-magnetic layer thin back when we made a Magnetic Knife Holder. For a quick and dirty test, we figured we would try some of our Plastic Coated Magnets beneath an opener. For an opener already mounted to a garage workbench, this might be a great, non-nonsense solution. We prototyped this by taping magnets behind a thin sheet of wood. The wood was 0.065” thick, just over 1/16”. We would not recommend using anything much thicker than this. BY0X08 2” x 1” x ½” thick block 24+ (48), strong! arranged with alternating polarity Only 4-6. Not recommended. If you are mesmerized by falling bottle caps snapping to a magnet, here is a really long video (8:51) showing a bunch of our testing. It's a little repetitive, but by trying a number of different magnet sizes we were able to find the results we wanted. 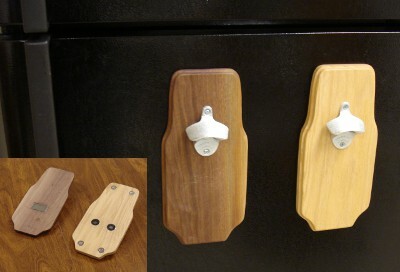 Rear and front views of two magnetic bottle openers. We made a nice solution on the left using a strong, BY0X08, 2” x 1” x ½” thick magnet. The strength of this magnet alone is enough to hold it in place on a refrigerator door. We did use two small pieces of grippy tape stuck to the back of the wood (not double-sided), which increased the friction enough to prevent it from sliding around. The opener on the right used two DX08 magnets, both with the same pole facing outward. It also used four RC22CS-N magnets at the corners for a secure hold to the fridge door. This is really strong, even a little difficult to remove from the door! While the opener made with the darker wood uses the larger BY0X08 magnet, we really like the results even using smaller BY0X04 magnets. Cleaning off the caps one time per case of drinks seems reasonable to us. Here's a video of these openers in action. Cheers!